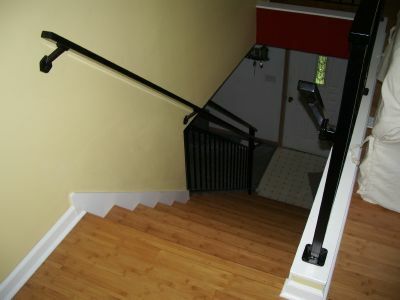 Indoor railing with a removable handrail. 115’ of railing for a condo association. We built a cover for the storm drain that was powdercoated to match the railing. Note the bend in the handrail to follow the offset in the wall. 28’ of railing with ornamental baskets. This is 135’ of railing at a college. The handrail needed to be continuous all the way down the ramp and steps. Deck railing mounted on the side edges instead of on the decking. 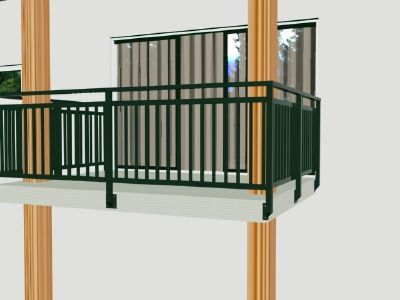 We used a 3D CAD program to see what the railing would look like before we built it. 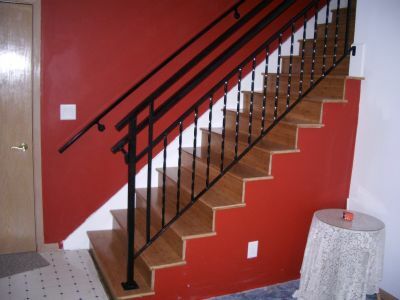 Before and after pictures of an old wood railing replaced with a metal one. Note some of the pickets are braided with leaves welded on them. A total of 12 railings for a condo unit. We used a textured powdercoat finish. Railing for a clinic. Round tube frame with square tube pickets. We finished the railing with a textured powder coating. Railing/handrail combination with a geometric pattern. This is a railing with a heavier look and decorative post caps.